Ben Berden. Photo: Todd Prekaski. Ben Berden – last weekend Berden split wins with Ryan Trebon and I expect the same to happen this weekend in Cincinnati. Look for Berden to get the upper hand on day one. Ryan Trebon – Trebon has been riding very well this season and is always a podium threat. While I’m giving the edge to Berden, it wouldn’t surprise me if he landed on the top step. Jamie Driscoll – Driscoll rode to a solid second place finish last year at this race. I expect much of the same and look for him to wind up on the podium. 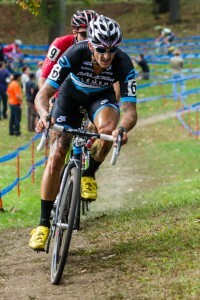 Ryan Trebon – last year Trebon picked up the victory at Lionhearts ahead of Tim Johnson and Jeremy Powers. Look for Trebon to repeat on Saturday. Ben Berden – Berden finished just off the podium last year after a hard fought battle. I expect him to land on the podium and defend his Cross After Dark series lead. Jamie Driscoll – look for Driscoll to land on the podium this year after finishing fifth last year. If Driscoll can escape early, he may be able to hold of Trebon and Berden, but I expect those two to prevent that from happening. Ryan Trebon – Trebon skipped the World Cups and hasn’t managed to pick up a victory in a C1 race this season (as has everyone else not named Jeremy Powers). Look for the tall Cannondale p/b Cyclocrossworld.com rider to pick up an important victory at Harbin Park. Ben Berden – if you haven’t noticed a trend yet, Berden and Trebon will dominate this weekend. In my opinion they’re two of the top three riders in the US. Look for Berden to continue his strong season with another podium appearance. Tim Johnson – with C1 points on the line riders like Johnson and Zach McDonald are making the trip to Cincinnati for Sunday’s race. After two World Cup rounds, and a bit of travel, Johnson may be a little tired. However, the experience of World Cup racing is invaluable and I expect him to podium. Jeremy Powers – despite not being on the start list, I have been told Powers will be in attendance this weekend. Hands down, Powers is the best rider in the US. Even though he may have some jet lag and be tired from his European foray, he will still be the man to beat. Adam Craig – fresh off two UCI C2 wins, Craig has reminded us all how good of a cross racer he once was and still is. He’s riding so well right now, I expect him to podium both days. I also wonder how good he would be if he went back to racing cross full time. Justin Lindine – Lindine continues to have a solid season even though he hasn’t hit the top step of the podium much. I expect him to podium one day this weekend. Dan Timmerman – in what really should be called a comeback season, Timmerman continues to surprise me with how strong he really is. He should podium this weekend in Northampton. This entry was posted in Races and tagged ben berden, cincy 3 day, Craig, cross after dark, Cyclocross, dan timmerman, jamie driscoll, jeremy powers, justin lindine, nepcx, ryan trebon, tim johnson. Bookmark the permalink.